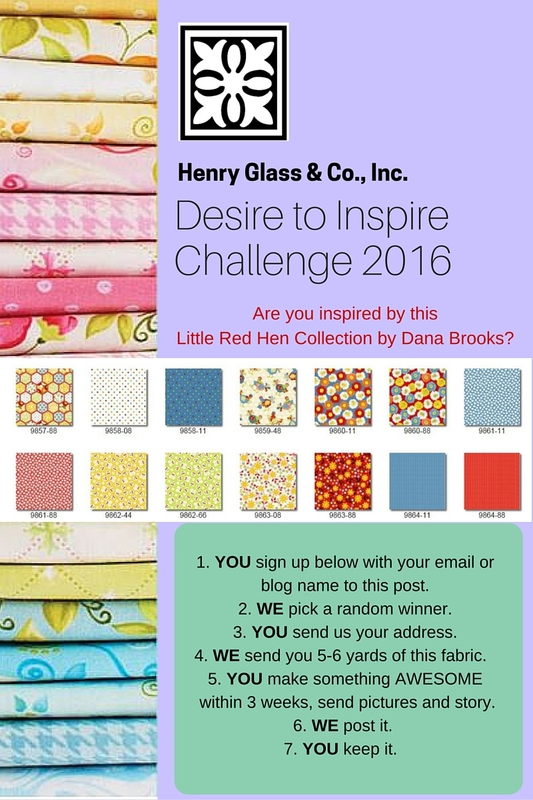 We are changing up this sweet little Challenge for 2016, and we hope you like it! If you want to take part, and your schedule allows you to turn a project (of your choice) around in a 3 week time period, then this Challenge is something for you. This will be a random giveaway, so all you need to do below is give us your email, or blog name in the comments section below and we will pick a winner on February 1. We will be in touch next week to get your fabric out to you, and would like to post your project, and a short bio with some pictures on February 29th. This is an interview from our most recent winner of the Desire to Inspire Challenge! Family: I have been married to my best friend for over 35 years. I have a daughter, a son and one grandson. 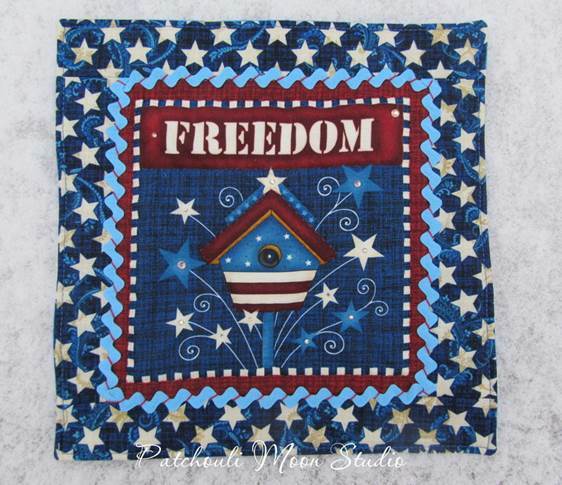 How long have you been quilting: I first began quilting back in the early 1970’s. My mother taught quilting at a local college in the evenings and then a couple of years she later opened a quilt store in Tarzana, California called Quilt ‘n Stuff (in the mid 1970’s). I worked full time in the shop for my mom. Piecing, appliqué and quilting was all done by hand back then. Tracing around cardboard templates onto fabric and then cutting the shapes out with scissors. Mom’s shop only lasted for a year. If she had only known rotary cutters, rulers and mats would soon be invented around 1980, I wonder if she could have hung on until then? Our lives would both be different today though. I wouldn’t have met my husband and I am glad that my life turned out the way is has, but still it makes you wonder what would have happened. Then some years later when I had young children, I picked up a VHS tape of a PBS show starring Eleanor Burns called Quilt-in-a-Day, at our local library. I was amazed when I saw Eleanor using a rotary cutter, ruler and mat and how fast and easy it looked. Plus she sewed the pieces on her sewing machine! I had to try that! So I ordered her rulers and her book and then bought a rotary cutter and mat at the local fabric store. I was hooked! I have been quilting, piecing and doing appliqué ever since. I have gone much farther with quilting than my mother ever did. What's your favorite technique? I love fusible appliqué the best. I usually sew a blanket stitch around the appliqué. Who taught you how to quilt? I watched my mother and picked it up from her. She would be preparing quilt blocks for the classes that she taught. I borrowed her books and taught myself. Mom was there to help if I had a question, but she was too busy to sit down and actually teach me every step herself, LOL!!! Do you belong to any guilds? I do belong to three groups that each meet once a month. Occasionally I go to a large quilt guild that I used to belong to. I prefer the smaller groups because I have really gotten to know these ladies, whereas with the larger group you really can’t get to know all the women very well. 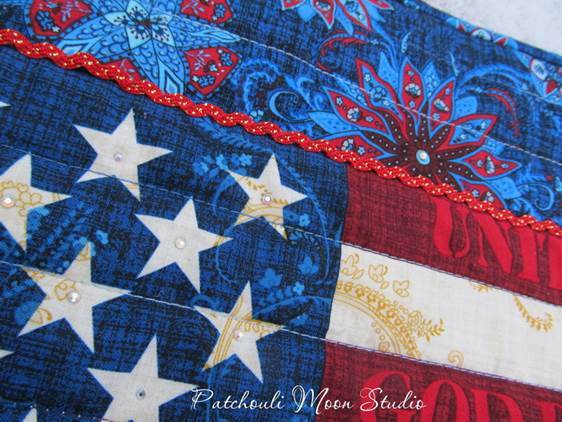 I made a flag banner out of the fabrics that I received (Patriotic Primer). It was hard to get a really good photo of this on my wall, but it looks wonderful in person! 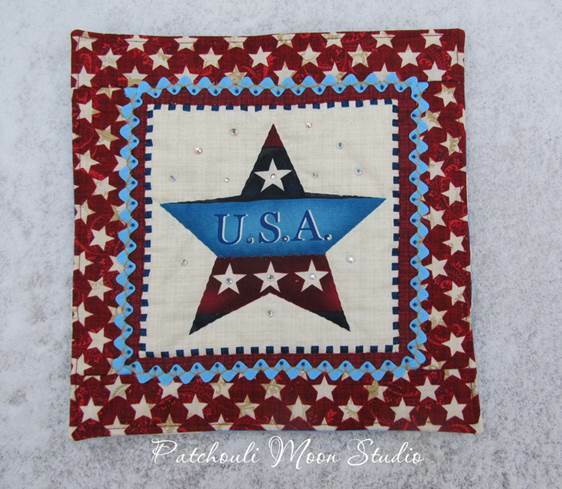 What a great sewing weekend we had - snow up and down the east coast, and cooler weather everywhere! Finally. Winter! It's time now for this week's giveaway, and thank you so much for all of your comments last week. Take a look here and see what everyone says about the "Simple Life". It seems we all agree, that there is wisdom to be found in slowing down, returning to some values that seem to be forgotten. Time-crunches, technology (although we still love reading blogs), and electronics have moved in and captured our sewing time!! Not to mention our time with family, friends and just plain quiet. It's a goal that we should not lose focus on. It was very nice to read all the comments, and thank you EVERYONE for taking a moment to relish the thoughts of what a simpler life would look like. Simple life reigns! 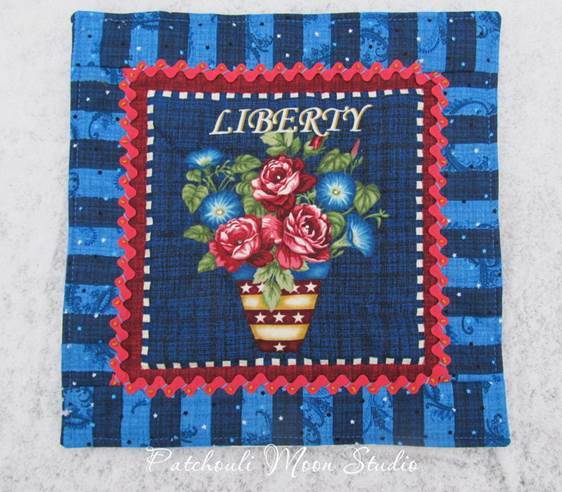 This week's giveaway is from the Roswell Mill Collection in the "Reflections of the South" series by Mary Ellen Von Holt of Little Quilts. 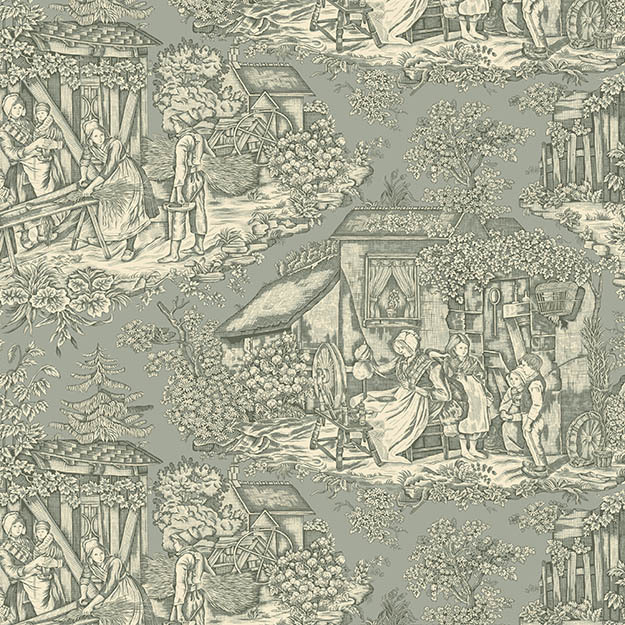 The drawings of the toile are based on actual rendering of a typical cotton mill in the South during the 1800's. The drawings of the toile are done so well that it shows the workings of a mill from the processing of the cotton to spinning the fibers into cotton we use in our quilt making today. This week's giveaway is kind of a 'collectors' item', because it is a part of history now that won't be back this way again, just like the cotton mills that the collection is named after. Slowing down but not out, Mary Ellen from Little Quilts has a recent release called "Savannah Garden" that will ship into shops in August 2016. Mary Ellen has closed the retail store, after seventeen years in the brick and mortar store; to spend more time with her family and 5 grandchildren, and now will have more time to design new collections for Henry Glass. She still has the website: www.littlequilts.com, where classic Little Quilts patterns and booklets are available for purchase online. Partners Alice Berg and Sylvia Johnson have retired. For over 30 years, Mary Ellen , Alice and Sylvia, through their company Little Quilts, has been a mainstay in the quilting community, designing patterns and booklets for making small quilts that were not miniature in size. Mary Ellen, Alice and Sylvia have designed for Henry Glass and Co. for 20 years, and authored books for Martingale & Company...one of which "Little Quilts All Through the House" is now an e-book; but can also be ordered along with "Patriotic Little Quilts" on their website www.littlequilts.com. 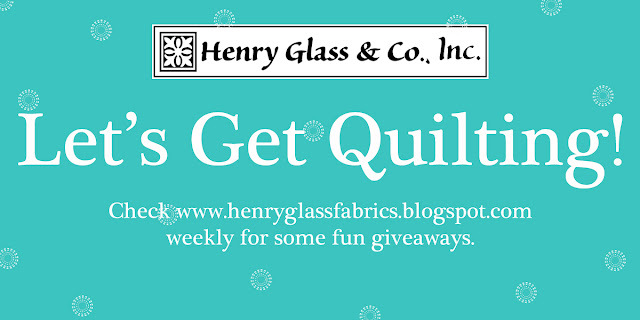 When Mary Ellen teaches and lectures, quilters continue to comment in person and on the website that...."they learned to quilt with the patterns by Little Quilts"; and loved the collections from Little Quilts for Henry Glass fabrics. 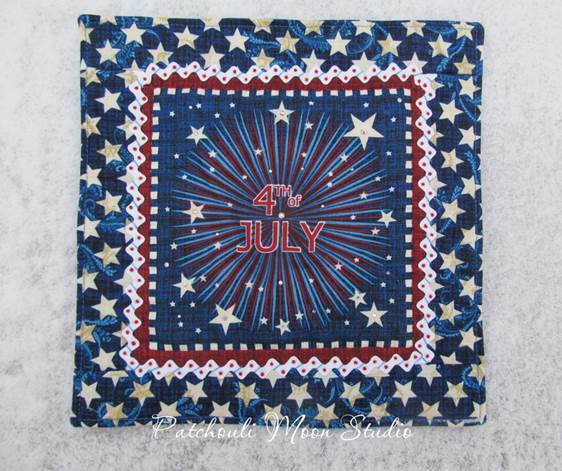 In the near future, Mary Ellen plans to spend more time developing her fabric collections for her "Reflections of the South" series with plenty of patterns and projects in support. To win this week's giveaway, (and since everyone's comments are so much fun), let's hear if you have a favorite fabric collection or pattern from Little Quilts, that you have enjoyed working with. Applique is one of the most beautiful results that can be found in a quilt, it is also one of the most time consuming techniques to undertake. Designer Kim Diehl has taken some of the pain away by introducing us to a time-saving machine method that she calls "Invisible Machine Applique" technique. 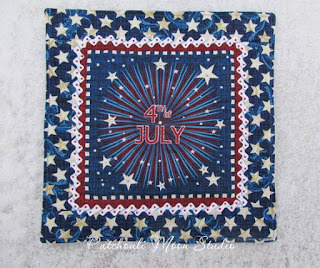 And even better, here is a video tutorial as Kim Diehl herself takes you through the steps on her "Invisible Machine Applique" technique. If one of your goals this year is to master or quicken your applique technique, this is the place to start. If you saw our interview on the blog last week with Martha Walker, you will recall that we closed with the question of simplicity, and how Martha's fabrics from "A Prairie Journal" are reminiscent of a period in history when quilt making was more of a tradition built into women's lives from necessity, than a hobby eked out of our spare time. Having said that, this week's giveaway is from Martha Walker's last collection with Henry Glass Fabrics called "Sentimental Stitches." You may still be able to find this line in your local quilt shop, but it is sold out from our warehouses. We found this darling bundle in the closet. To win, you just need to comment on the blog by answering a simple question; "What would a 'simpler life' look like to you?" The giveaway begins today and ends Saturday at midnight (EST). We caught up with Henry Glass designer, Martha Walker of Wagon West Designs, who is the face behind the recently released collection, "A Prairie Journal". Martha's exciting news is that she is working on a new book that will be released this spring. HG: Thanks so much for taking a few minutes for Henry Glass blog fans. Any designer that also moves into the realm of author is inspiring. Please share with us more about the book, what it's about and the focus. Martha: My series started with Annie's Scrapbag 4 years ago. I came up with the concept while on a hike, which is typical. Hiking is a great way for me to free my mind and come up with ideas. I like having a theme to center a collection of projections around. I also love history in general, and specifically, the history of quilt making, especially the time period of the nineteenth century. Each book in the series centers around a fictional quiltmaker living in the nineteenth century, a little about what her life is like or what inspires her. The projects in the book then reflect the quiltmaker's story, with the projects including quilts, wool applique and other needlework projects. The book that is soon to be released is actually second in the series, called "Betsy's Scrapbag." It's an exciting story of her life and her motivation during that time. HG: What made you decide to self-publish versus the traditional publishing route? Martha: I have done both, and there are definitely a lot of advantages to going the traditional route. But because this was going to be an ongoing series, I wanted to have complete creative control over both the look of the book and the content. HG: Is book writing still allowing time for creating projects, collections, and teaching? 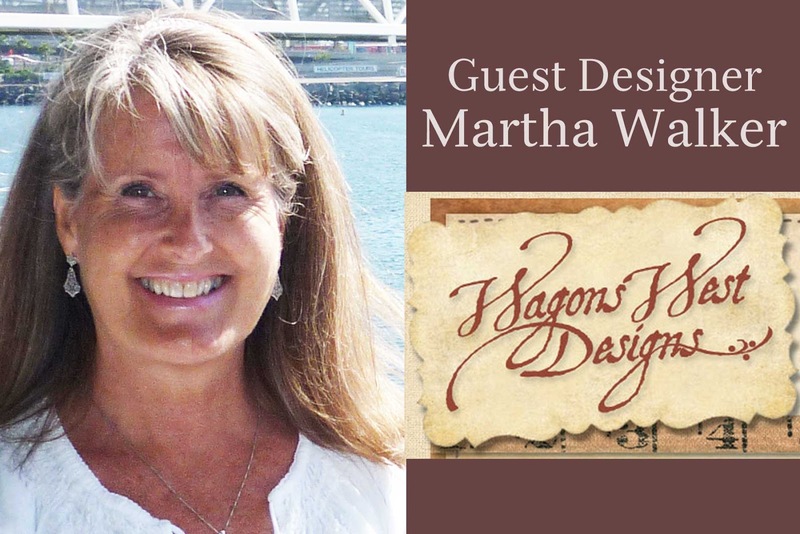 Martha: The bulk of my time in working on a book is the actual designing and production of the projects, during which I normally take care of most of the instructional diagrams and templates as I go along. I don't really have a set time to finish (an advantage to self-publishing) - when I have a good collection of projects, I'm done! While I'm working on the projects I can take breaks for teaching, working on collections, etc., as I go along. Crunch time is when all of the projects are completed and it's time to sit down and put it all together with the written instructions and organization of the book. HG: What is the priority in life these days for you? Martha: Of course, family always comes first! 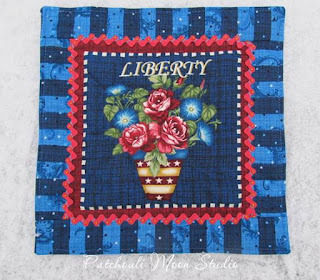 Creatively, I would like to continue designing fabric collections that render a vintage appearance, continue designing projects for my book series, and sharing my love for quilt-making and other needle arts with others. HG: Thank you Martha, we are so lucky that you have shared your talents with us! Everyone, please visit the website to see Martha Walker's newest collection, "A Prairie Journal." You can see for yourself that she truly is artistically inspired by the simplicity of an earlier time. Here's a picture of her strike-offs from her latest collection. How about you? Does simplicity inspire you? Do you sometimes dream of having a simpler life? (Aside from churning our own butter, of course). Fun New Giveaway Starts Today! 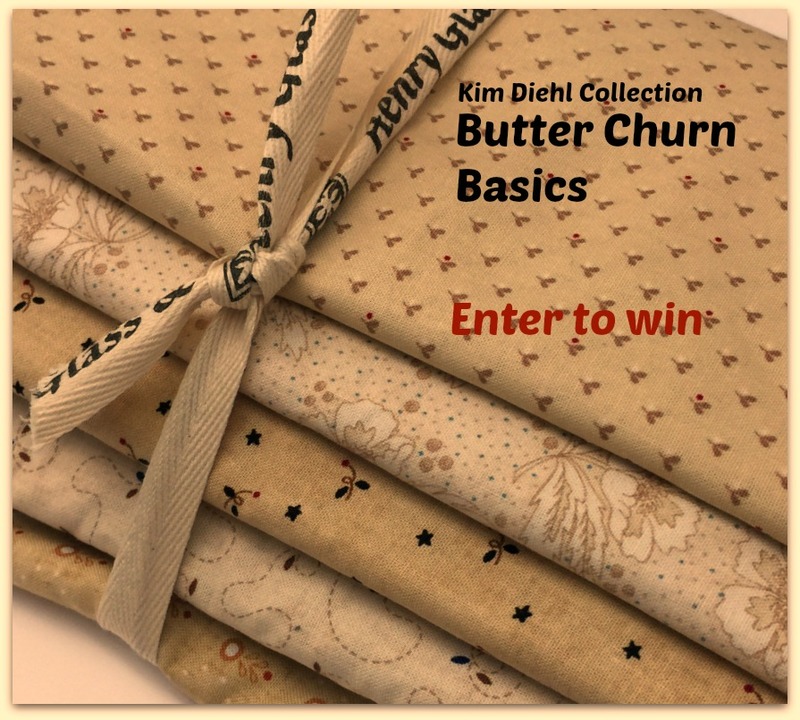 For the next giveaway of 2016, we have Kim Diehl's Butter Churn Basics Collection Bundle. The soft warm buttery colors are perfect for that winter project. Free is good. Read this now for a FREE Buggy Barn Basics Charm Pack - today only. 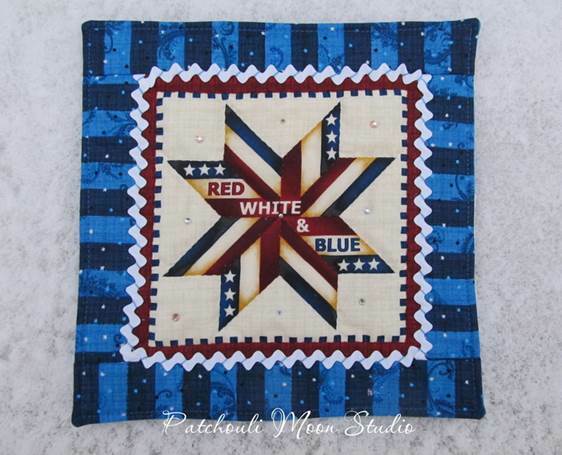 Just wanted to give you a quick update for those who see this post TODAY (Jan. 7, 2016) that our friends over at Missouri Star Quilting are giving away a FREE Buggy Barn Charm Pack as part of their Happy New Year Sale! Head on over to their page to grab yours and browse the rest of the beautiful fabrics on sale. Did you make any resolutions this year? 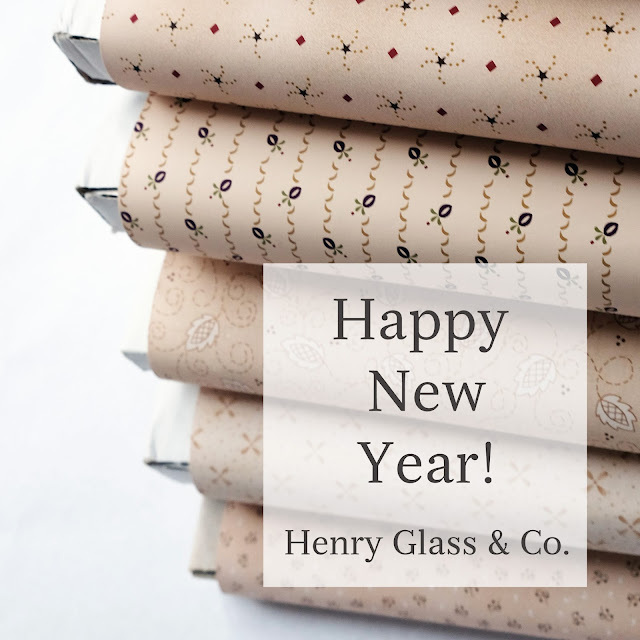 Do you have any quilting-related resolutions? 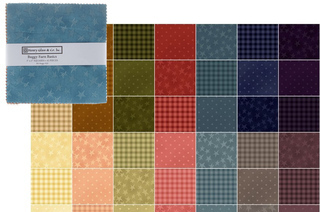 We are continuing our mission to bring you the best fabrics and to inspire you to get quilting! 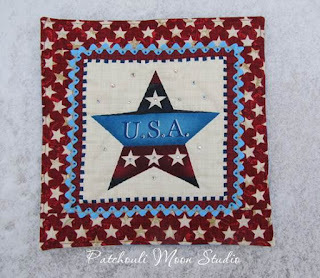 Let's Get Quilting was a popular feature on the blog and we are definitely going to continue with it. 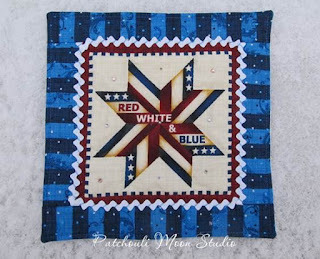 This week we are giving away a bundle of Patriotic Primer by Color Principle. Let us know what you have resolved to do in 2016! It's over! And the winner is: Cecilia Young.